Having reached the end of this inquiry into inquiry learning, I am feeling quite satisfied, and proud of what I have accomplished and how far I have progressed, as expected at the presentation and assessment stages, according to Kuhlthau, Maniotes and Caspari (2007, p.19). I also feel proud of my blog, and relieved that I have been able to communicate my learning in a clear and effective manner, after feeling overwhelmed and confused earlier in the process. I learned, first-hand, about the importance of immersion in a topic, before trying to find a focus; and also the importance of locating quality sources early in the ISP. The location of these sources takes skill, strategy, evaluation, and time – understanding this will help to ensure I plan for effective facilitation of this stage with future classes. I also now better understand the value and benefits of collaboration to co-construct new meaning. Although our blogs were completed individually, there were many opportunities for collaboration with fellow Masters students at different stages along the journey, including during tutorials, and via Facebook – I really did feel like part of a community of learners. I now feel empowered to use my new understandings about guided inquiry in future collaborative planning with teachers at my school. 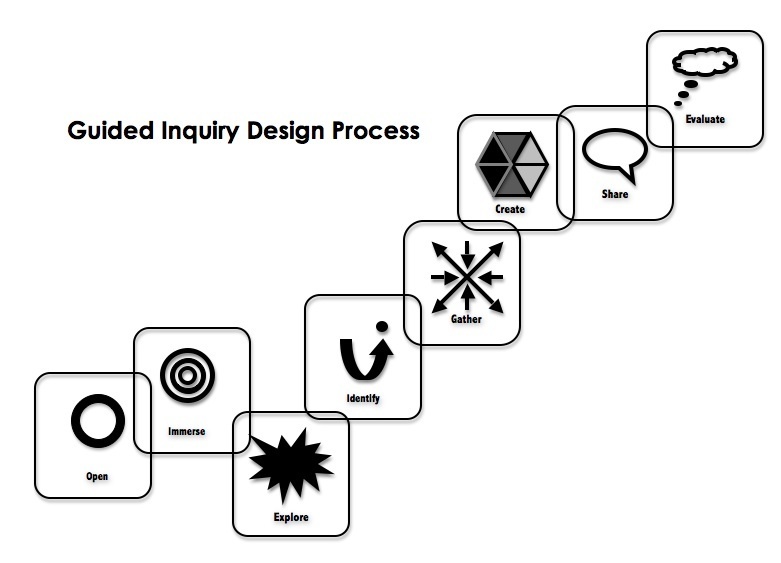 Does inquiry learning need to occur within a whole school approach in order to work effectively? 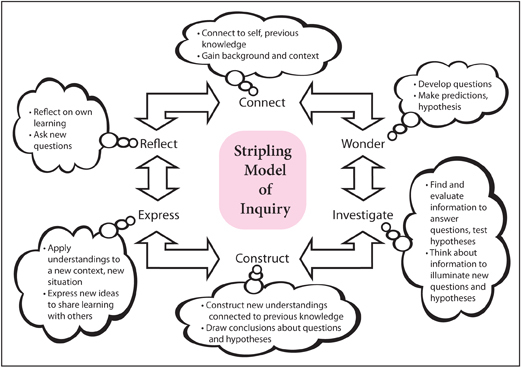 From my experience and exploration, I would suggest that inquiry learning does work best when implemented as part of a whole school approach, which would include flexible timetabling, promotion of inquiry learning, and appropriate professional development for teachers. However, with teacher training, and careful thought, planning, and scaffolding, successful inquiry learning is still possible within a more traditional school environment. 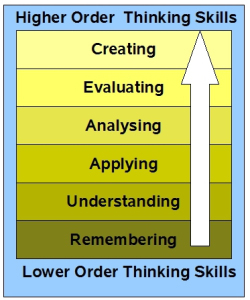 Do weaker students need extra guidance and/or structure, or do they succeed by working at their own level, optimising their strengths and/or collaborating? As pointed out by FitzGerald (2011) and others, all students require some guidance and structure when carrying out an inquiry. As inquiries are individualised and open-ended, the ISP focuses on students’ own interests and strengths, while students work collaboratively to co-construct new understandings and develop their own skills in information literacy. Learning through an inquiry process means that all students benefit as they locate, evaluate, share and use information in a community of learners. What kind of learning spaces best facilitate inquiry learning? Learning can take place anywhere anytime. Students can learn in the physical environment, whether at school or on field trips, and students can learn in the online environment. Schools and teachers need to facilitate optimum learning opportunities in both environments. At school, a major consideration is the provision of collaborative learning spaces, as well as a variety of learning spaces and furniture, which suit different learner preferences, moods and tasks. Educators also need to provide online learning spaces, where students and teachers can collaborate outside class time, share ideas, ask questions, access resources, and learn from each other. This could take the form of Facebook groups, class blogs, shared Evernote folders, and a wide variety of other online tools. Buoyed by my new understandings about guided inquiry, I (as teacher librarian) recently approached one of the program leaders in History at my school, about collaboratively planning a guided inquiry for one program of study for next year. The teacher was very supportive and amenable to the idea. I am now in the early stages of planning this guided inquiry, in collaboration with the History teacher, and the Digital Literacy specialist. I am very excited about this project, and look forward to sharing and using the information I have co-constructed through my inquiry into inquiry. The Year 10 Geography course allowed for only four class periods, of 55 minutes each, for students to work on this particular inquiry at school. Given such time constraints, the teacher had little opportunity to take action after the first questionnaire. Many students noted, at the start of the topic, that they generally found it difficult to find specific, detailed information. Therefore, a lesson centred around expert search strategies could have proven to be very useful to this group of students, but time did not allow this. Also, as around a third of students responded that they had no interest in the topic, in the first questionnaire, a learning activity could have been facilitated to create more interest and excitement about the topic, if more time was available. As most guided inquiry models suggest, tuning in / initiation with the topic at the start of an inquiry is an essential stage in the process, and I will discuss this further in my recommendations post. Teaching points during this project were, by necessity, brief, and related to assessable criteria with which the teacher felt the students might need assistance and/or which students raised as problematic. She introduced them to the online bibliography generator, which is available to students through the school “moodle” page, resulting, in the final questionnaire, with at least one student mentioning this tool as something they found easy to do when they research. 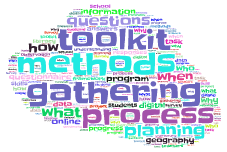 She began another lesson with a brief, hands-on activity to introduce the students to creating focus questions, after discovering, through conversation, that students had little or no experience with this vital part of the inquiry process. By the end of their inquiry, students were required to present a written report on one issue related to the health of the Swan River. Several students were unsure how to appropriately plan and structure a report, so the teacher presented them with a planning template, which most students found very helpful. The above examples demonstrate a willingness, by the teacher, to cater to student needs, as they arise in class. Although this teacher was not able to take significant action, based on results of the first questionnaire, she will be more likely and able to take action in the long term. After analysing the results of both surveys, the teacher now has the opportunity to share this information with colleagues, and use the information to guide future planning. In order to examine the development in students’ skills and understanding, as well as any change in attitudes and emotions, over the course of the inquiry, my primary method for collecting this data was via a questionnaire. As the school has a 1:1 laptop program, and is currently promoting digital literacy, I created an online questionnaire (click here to access) using Google Docs. Apart from being visually appealing and easy for students to access and use, this tool provided me with the added benefit of automatically saving and collating all responses, so I did not have to worry about losing or sifting through paper responses. I would highly recommend this tool for surveys, questionnaires and quizzes, with high school students in particular – it can be accessed as part of the Google Drive section of any Google account. The format and content of this questionnaire is based on the School Library Impact Measure (SLIM) toolkit, developed at the Center for International Scholarship in School Libraries, by Todd, Kuhlthau and Heistrom (2005). This toolkit was designed as a means of assessing student learning throughout a unit of guided inquiry, and enables teachers “to chart students’ knowledge and experiences throughout the process” (Todd, Kuhlthau, & Heistrom, 2005, p.5). 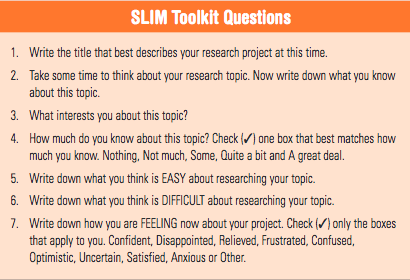 I have used a version of the SLIM toolkit, which has been used by Lee FitzGerald (2011, p.29) with Australian Year 11 History students, as this is closely linked to my ILA students. My ILA is a Year 10 Geography class, researching the health of the Swan River. This is not a class I teach, and I was present purely as an observer. As the unit of work was only running for four to five weeks, two of which were school holidays, and given that they were only allocated four lessons to work on their inquiry in class time, I chose to employ only two questionnaires – one at the start of the inquiry and one at the end. I undertook the questionnaire across two classes, each with the same mix of abilities, and with the same teacher, and collated their responses as one group. Each class consists of 25 students, but I knew my chances of obtaining two completed questionnaires from every member of one class was unlikely, given that some were planning early or late holidays, some have music lessons during class time, and some might have to complete other work in class and not have time for the questionnaire. Out of 50 students, I received completed responses to BOTH surveys from 31 students, which is a useful number to work with, in terms of this analysis. Each questionnaire was completed during class time, and each one took approximately 15 minutes. I was present during the completion of each questionnaire, to direct the students to the online survey, which I had uploaded onto their Year 10 Geography Moodle page, to personally clarify the task, be available to answer queries, and to thank them for their assistance and participation. I explained to the students that their responses would not be shared publicly, and that the information would be used to give teacher librarians (of which I am one) and Humanities teachers a better understanding of how the students feel about the research process, and what areas of information literacy need to be addressed to a deeper extent in future planning i.e. for the benefit of students, as well as teachers. As well as conducting the questionnaire, I was also able to observe the students, while they undertook their research, and to observe the methods the teacher used to facilitate the inquiry, including task documents and frameworks. By observing classes in action, I was able to gain a better understanding of reasons for questionnaire responses, and to acquire additional information about how the students undertook their research. I observed each of the two Year 10 classes on three occasions, during their inquiry task. I was able to walk from student to student to observe, ask questions and answer questions. I also presented a brief revision workshop with each class, concerning using the online bibliography generator. The class teacher was very helpful and supportive of my project, and emailed me any relevant documents and frameworks, related to the students’ inquiry task. Todd, R. J., Kuhlthau, C. C., & Heinstrom, J. E. (2005). School library impact measure (SLIM): A toolkit and handbook for tracking and assessing student learning outcomes of guided inquiry through the school library. New Brunswick, NJ: Center for International Scholarship in School Libraries, Rutgers University. As one would expect, there are overall changes in students’ responses between the first and final questionnaire, largely due to a deeper understanding of the topic, as a result of the inquiry process. However, some students remained unengaged throughout the inquiry. These results will be addressed and analysed separately for each question, below. Direct quotations from student responses will be presented in their original form i.e. errors in spelling, grammar and punctuation are student errors – this gives a more precise insight into the students themselves. The topic that the students were given was “The Health of the Swan River.” Participants were studying Year 10 Geography in a co-educational, metropolitan school. 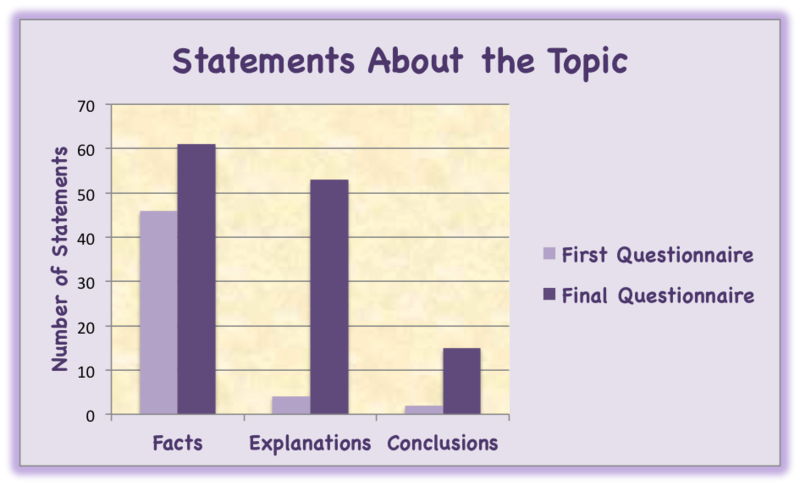 As set out in the SLIM toolkit (Todd, Kuhlthau & Heistrom, 2005), I first categorised all students’ responses as either factual statements, explanation statements, or conclusion statements. I then created the above graph to represent my findings. Students each gave varying numbers of statements, ranging from 0 from a couple of students in the first questionnaire to 10 from one student in the final questionnaire. In his first questionnaire, Student R responded to this question with “N/A.” In contrast, his final response demonstrated significant new learning in the form of facts, explanations and conclusion: “Feral Fish are a major problem in the Swan River. -They can cause native fish species to die out, spread disease and dig up the river. -They are a threat to the health of the Swan River. 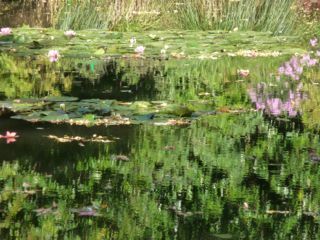 -They are dumped into the river by people who don’t want them anymore.” On the other hand, Student B’s responses showed far less progress – going from “nothing” at the start of the project, to “the water is not very clean” at the end. Student B appears to be lacking effort and enthusiasm for the inquiry project – approaches to potentially reduce this issue, which was also experienced by a few other students, will be explored in my Recommendations post. 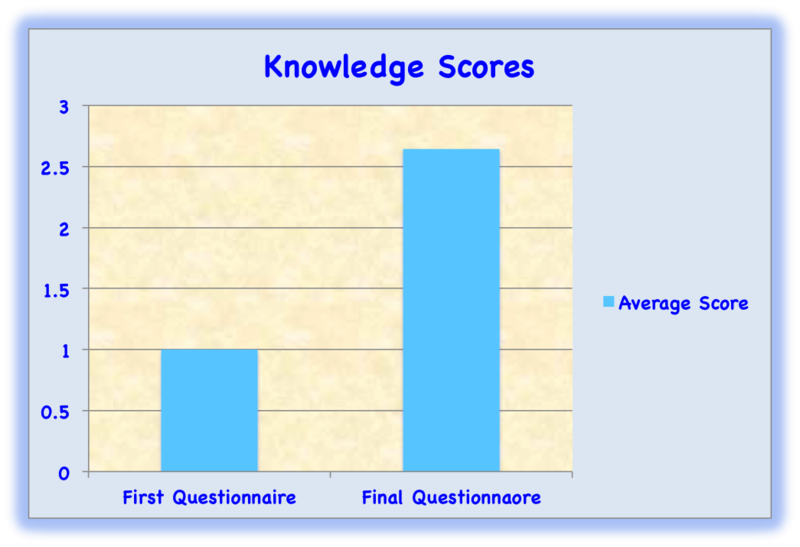 As can be seen in the above graph, most students knew Not Much about the topic at the outset of the inquiry, but this perception of their knowledge jumped to almost Quite a Bit overall, by the end. Within individual responses, some students’ increases in scores were more dramatic than others. For example, Student L changed from Nothing to A Great Deal and several students moved up at least 2 categories. Smaller changes were generally recorded for those students who had already scored fairly highly on the first questionnaire. However, there were a couple of instances of students who responded with Nothing or Not Much in both questionnaires. Again, this disengagement will be discussed in my Recommendations post. While there is a pleasing change between the first and final questionnaires, there is still room for improvement, as ideally the average would be closer to 4: A Great Deal. This graph demonstrates how students’ interests changed over the period of their research, based on their new learning. Although a wide variety of responses was given, distinct themes emerged, which can be seen in the graph. 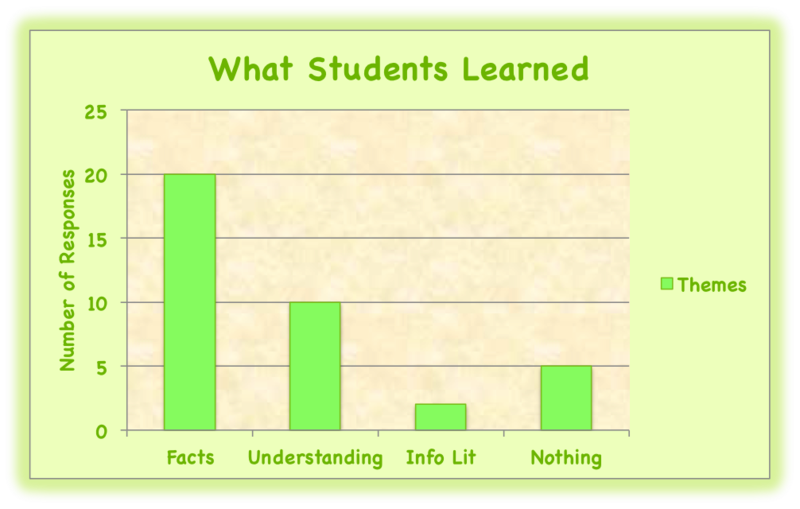 The decrease in the response of Nothing / Don’t Know shows that a higher percentage of students became engaged in the topic, over the course of the process. While students stating their interest in an environmental issue implies an interest in wildlife, I only added to the Wildlife tally if this was explicitly mentioned. Responses included under the theme of Wildlife include “I like swans” “there are fish in the river” and “swan river jellyfish.” Responses categorised under Leisure Activities were, similarly, mainly short and fact-based e.g. “water skiing” and “it has heaps of boats in it.” However, one student reflected on the impact of the river’s health on the leisure activities – “Jet Skiiing is a problem now since the water is dangerous to swim in,” demonstrating higher level thinking. 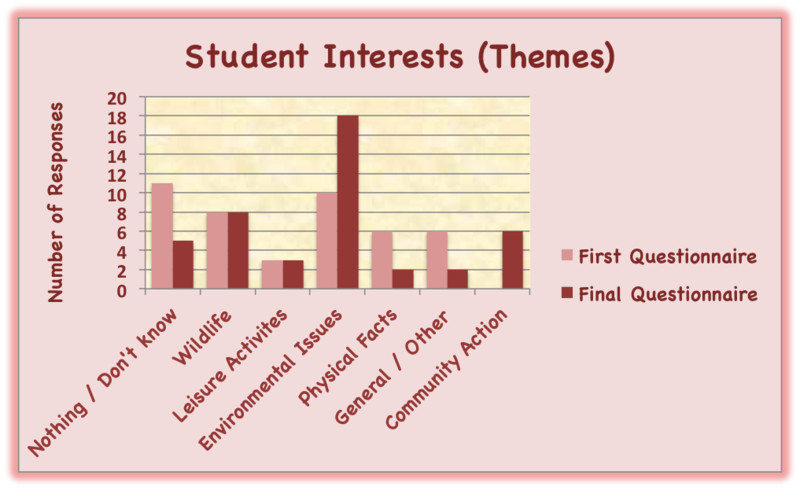 As with responses to “Write down what you know about this topic,” an increased understanding was evident in responses about interests in the final questionnaire, within the theme of Environmental Issues. For example, in the first questionnaire, students responded with “The conservation aspect of the topic” and “The fact that it’s addressing the environmental issue of pollution with negative annotations.” After the project, responses were more sophisticated e.g. “The thing that interests me about this topic is how all these small things can have such a major effect on a river and which can then create issues for animals and humans” and “How the algal blooms manage to kill most of the fish in the river.” This was also the theme with the most dramatic positive change in interest from one questionnaire to the next, demonstrating that education about a specific issue can increase interest in the issue. Most of the student responses to this question, in both questionnaires, concerned the location of information. One of the main changes between responses in the two questionnaires can be seen in the emergence of additional themes. This was not surprising, as the teacher focussed on specific skills throughout the inquiry, such as developing focus questions, and creating a bibliography. Based on observation and conversation, most students had very little prior experience in formulating their own questions to guide an inquiry or research project, which explains why this was not mentioned in the first survey. I will discuss this further in my Recommendations post. Unlike at the start of their inquiry, by the time students completed the final questionnaire, many of them found it easy to find more detailed information on a specific topic. This may be partly due to students being given some key, useful websites at the start of their research, such as that of the Swan River Trust, which I observed many of the students using as their predominant resource. Therefore, the high scores for this theme on the final questionnaire are not necessarily due to students becoming more skilful at using expert search strategies, which results may imply. As expected, fewer students (only 2) found Everything difficult to do by the end of the inquiry, inferring that nearly all students felt confident about at least one aspect of the process. 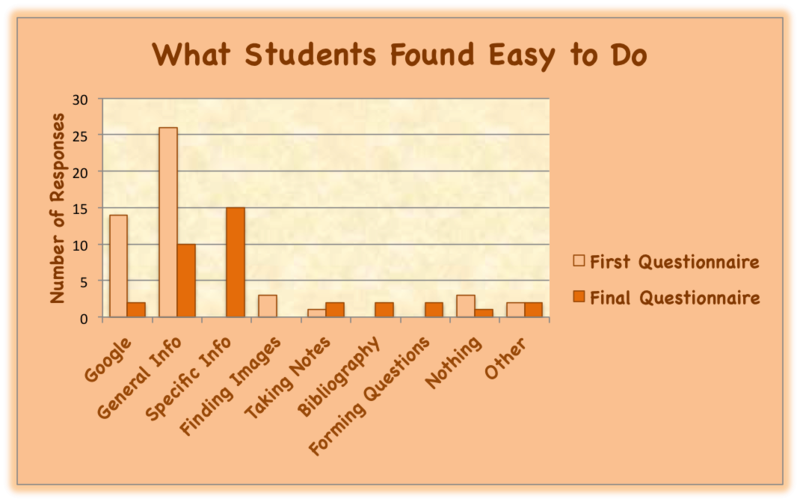 As also seen in results for “What Students Found Easy to Do,” most responses here concerned the location of information. This demonstrates that this stage is the primary focus of research for most students, possibly due to lack of experience with an inquiry-based approach and process. 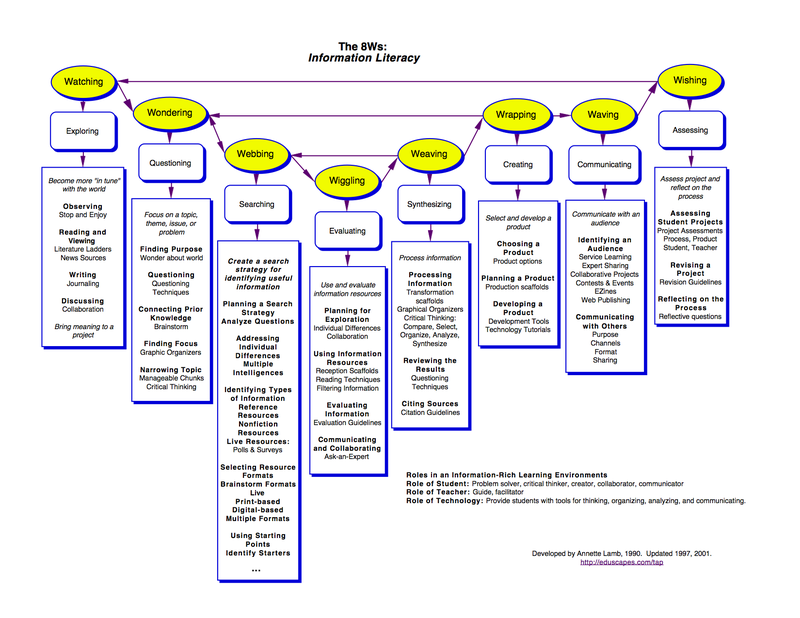 Responses appear to suggest that students are not as familiar with other aspects of information literacy, such as evaluating information, formulating questions, synthesising information, and communicating information. 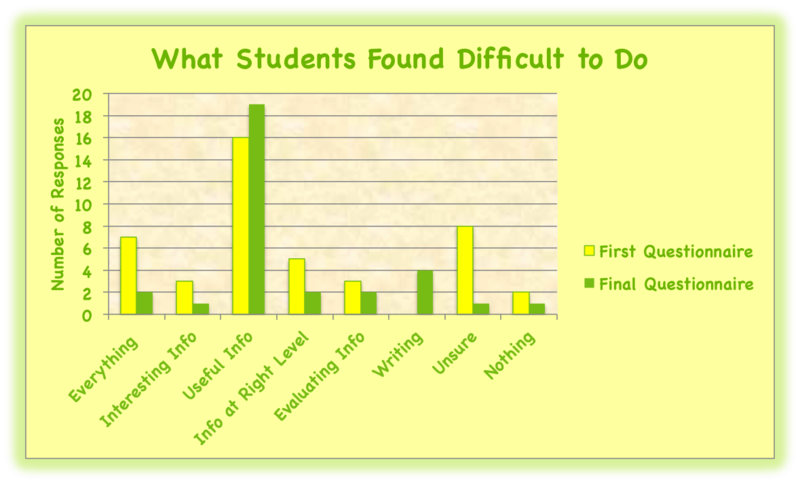 Although a significant proportion of students reported that they found finding specific information “easy to do,” more than half of the students also claimed that finding Useful Info and/or finding Info at Right Level proved to be difficult. It appears that, while many students were able to locate information on a certain topic without too many problems, the difficulty lay in finding details or answers to their specific questions e.g. “It is difficult to know who is responsible and exactly how do contaminants end up in the river” and “It was difficult to answer ‘where questions’, such as ‘where is the most polluted part of the Swan River? '” Student N was disappointed that one particular website did not contain all the answers he required: “The Swan River Trust website did not have all the information.” These responses indicate that many students lack the skills to effectively search for detailed information, particularly online, and that they are not accustomed to finding and corroborating information from a wide range of sources. Methods to address this weakness will be discussed in the Recommendations post. 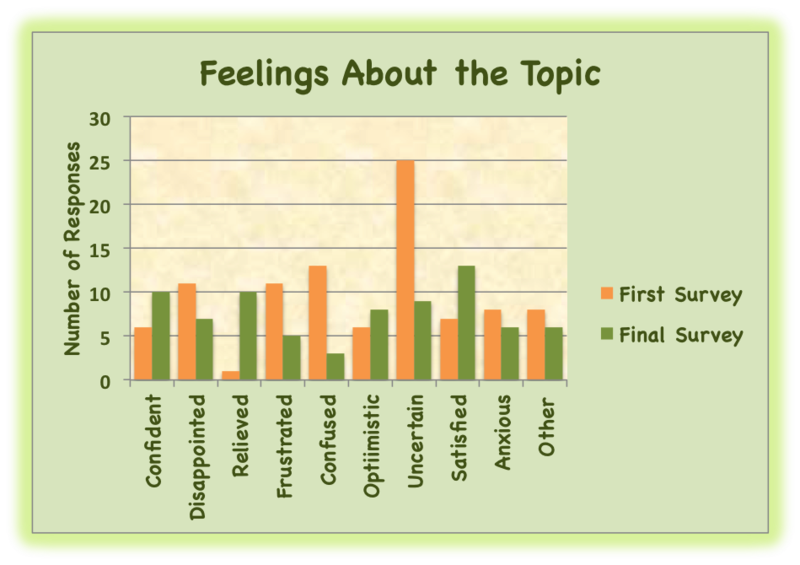 Students were invited to tick as many options as relevant to them, from the choice of feelings listed in the graph above. Unfortunately, I did not have the opportunity to also gauge feelings at a mid-point in the inquiry, which would have given a clearer idea of the emotional journey of the students through the process. 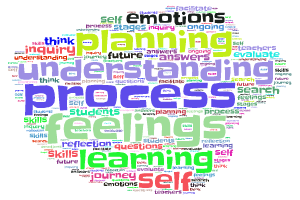 Kuhlthau, Maniotes and Caspari (2007) advocate that students experience different emotions and feelings at different stages of the inquiry process, represented by the options in the questionnaire. These authors claim that the dominant feeling at the start of an inquiry is uncertainty, which is certainly reflected in the results above. They also describe how students become more confident as they prepare to present their new understandings, and become satisfied at the presentation stage (Kuhlthau, Maniotes & Caspari, 2007, p. 20), which also rings true with student responses for this task. Many more students also felt relieved by the end of their research, but it is not clear whether this is due to completing the work, or finishing the topic. A number of students remained uncertain and/or anxious after presenting their reports, which may refer to concern about passing or receiving a good mark. Responses in the Other category included “don’t really care” and “hungry,” again highlighting a small proportion of students who lack engagement with the topic and process. The theme of Facts refers to surface knowledge, or information which is seen through a “Generic window” (Lupton & Bruce, 2010) e.g. “the water is not very clean” “I learned how algae reproduces” and “I learnt a lot about the Elizabeth Quay project.” The theme of Understanding encompasses statements which reflect a deeper understanding of issues, effects, relationships, and possible solutions, in line with Lupton and Bruce’s (2010) “Situated” and sometimes “Transformative” windows. Examples of responses which fit into this category include “The way we are living now could harm the river for a very long time” and “Perth’s riverside location means management practices in the Swan Canning Catchment will need to accommodate understanding of climate change impacts throughout the region.” Ideally, with a successful inquiry, responses in this theme would outweigh those in the Facts category, especially at a Year 10 level. Results therefore highlight students’ lack of experience with this type of learning and research process, and also the limitations on learning caused by a strict timetable and term program, as students were only given 4 class sessions, of 55 minutes each, to work on their inquiry. Also, student learning can be enhanced through collaboration, as will be explored in the Recommendations post, but this project was entirely individual. Peer feedback is a valuable way to learn more about this topic by reading and analysing blog posts by other authors, as well as having the opportunity to reflect on and refine one’s own blog posts after receiving comments from others. Please feel free to add comments and/or questions to any of my posts. Below, you will find links to two blog posts, which were created by other students of the Master of Education course at QUT. Under each link, I have reproduced the comments I made for each of these posts. These comments can also be found on the blogs in question. “You have found a great range of pertinent resources, both Australian and International, including the FitzGerald article, which I also used and found very valuable. Your summaries give me a really good idea of the authors’ goals and focus, with some standing out as must-reads for me in my own research. Having explored Kuhlthau, and Harada and Yoshina, I am keen to dip into Gillon and Stotter, Taylor and Young, Murdoch, and Lehman, in particular. Although my ILA is a Year 10 Geography class, I recently met with the History Co-ordinator to discuss collaborative planning for some History units for next year, with a Guided Inquiry focus. I am really excited (and a bit scared..) about this opportunity, and those resources will prove invaluable, so thank you! Although they are all directly related to History, you have clearly distinguished their varying content, which looks useful in different ways. If you have time, you might want to edit your summaries to reduce the word count, as some may exceed the recommended length. I would also suggest including the essay as a separate page or post, as it is not easily found from the tabs at the top. One tiny typo in the Callison summary: “exert” instead of “expert”. “Juliette, I really enjoyed reading your essay. You have drawn on a wide variety of sources to inform your learning, and have synthesised the authors’ main points in a clear and cohesive fashion. It is great to see how you personally connect with the theories and research mentioned, such as Vygotsky’s Notion of Intervention, and the Goldberg article. Two of the areas upon which you focus – emotions and social context – are crucial to the inquiry process, and you explain this well in your discussion. I liked how you explored Inquiry Learning in general terms, as well as specifically relating this process to your ILA topic of Religion, whilst also examining how more prolific studies, suggestions and frameworks in Humanities subjects can help guide the use of Inquiry Learning in Religion. You concluded your essay strongly, especially by presenting and justifying the Holistic model you will be utiising. 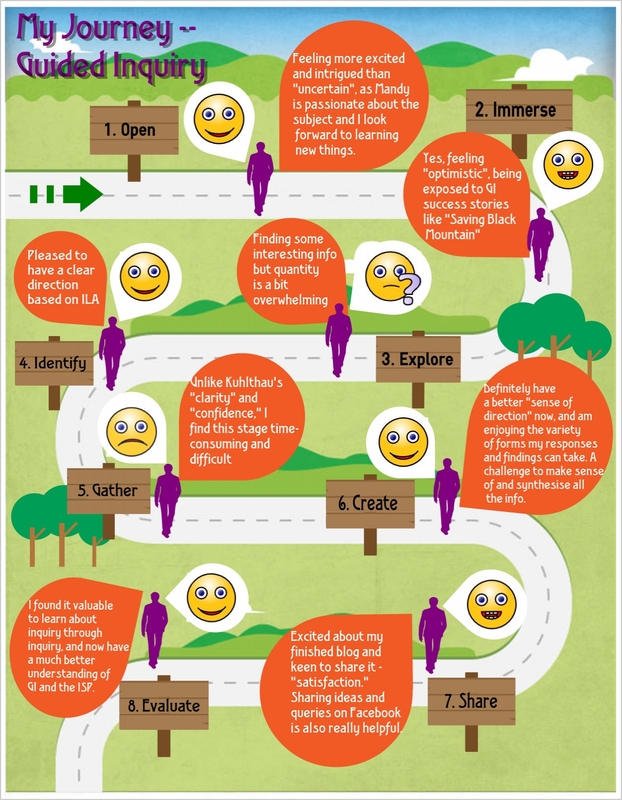 I also like this model, as it implies fluidity, as well as connectivity, between stages, it highlights emotions at each stage, and provides clear points of focus along the journey.